DUE TO THE RECENT ADVERSE WEATHER CONDITIONS AFFECTING THE UNITED STATES THIS EVENT HAS BEEN CANCELLED. The Centre for Applied Vision Research welcomes Dr Baskar Arumugam of the University of Houston, Texas, USA to the School of Health Sciences to discuss his recent studies in the effects of long-wavelength light on vision. Recent studies involving chickens and guinea pigs exposed to quasi-monochromatic long-wavelength lighting (LWL) develop more myopic/less hyperopic refractive errors, i.e., ametropias that are in the appropriate direction to maximize the luminance contrast associated with the eye’s longitudinal chromatic aberrations (LCA). However, the observed refractive changes are much larger than the predictions from LCA. Therefore, either the absence of chromatic cues and/or the presence of anomalous sign-of-defocus cues interfered with refractive development. In this respect, it is important to determine how the wavelength composition of ambient lighting influences the refractive development under imposed defocus conditions, especially in primates because it may be possible to manipulate the spectral characteristics of ambient lighting in ways that could have therapeutic benefit. Starting at the age of 3 weeks, the infant rhesus monkeys were reared under LWL along with +3 D or -3 D spectacle lenses for 4 months. Following the treatment period, the monocular hyperopic defocus, which normally produces myopic anisometropias under white light, failed to consistently produce myopia under the LWL. In contrast, monocular myopic defocus produced compensating hyperopic changes. These results indicate that long-wavelength lighting does not necessarily promote the development of myopia, which is contrary to predictions based on maximizing luminance contrast associated with LCA. 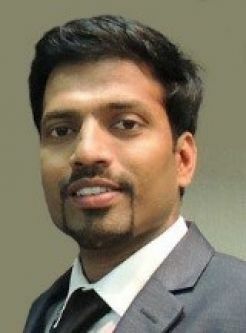 Dr Baskar Arumugam is a Research Assistant Professor at the University of Houston, USA. He received his BSc in Optometry at Bausch and Lomb School of Optometry, and a Fellowship in Clinical Optometry at the L V Prasad Eye Institute (LVPEI), Hyderabad, India. Baskar subsequent went on to complete his Ph.D. with Prof Neville McBrien’s lab at the University of Melbourne, Australia. In 2012, Baskar joined the Myopia Research Lab at the University of Houston to take up post-doctoral research training to define the optical performance properties of the vision-dependent mechanisms that regulate ocular growth in rhesus monkeys. His current research interest is to develop effective optical and pharmacological treatment strategies to reduce or inhibit myopia progression in children. Registration will be at 12.15, with the talk beginning at 12.30. A light lunch with refreshments will be provided with networking following the talk.